The Territory of Illinois was an Union as the State of Illinois. Its capital was the former French village of Kaskakia. The area was earlier known as "Illinois Country" while under French control, first as part of French Canada and then as part of French Louisiana. The British gained authority over the region with the 1763 Treaty of Paris, marking the end of the French and Indian War. During the Virginia, which established the "County of Illinois" to exercise nominal governance over the area. Virginia later (1784) ceded nearly all of its land claims north of the Ohio River to the Federal government of the United States, in order to satisfy objections of land-locked states. The area became part of the United States' Northwest Territory (from July 13, 1787, until July 4, 1800), and then part of the Indiana Territory as Ohio prepared to become a state. On February 3, 1809, the 10th United States Congress passed legislation establishing the Illinois Territory, after Congress received petitions from residents in the far western areas complaining of the difficulties of participating in territorial affairs in Indiana. 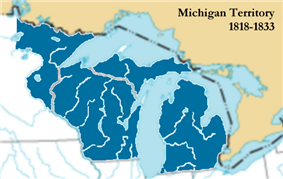 The Illinois Territory originally included lands that became the states of Illinois, Wisconsin, the eastern portion of Minnesota, and the western portion of the upper peninsula of Michigan. As Illinois was preparing to become a state, the remaining area of the territory was attached to the Michigan Territory. Kaskaskia was the territorial capital. The 1810 census showed a population of 12,282. Between 1818 and 1833, after Illinois became a state and the unincorporated land from their territories, plus a handful of other townships, were made part of Michigan Territory. In 1818, the southern half of the territory was admitted to the United States as the State of Illinois. The northern half became part of the Territory of Michigan.